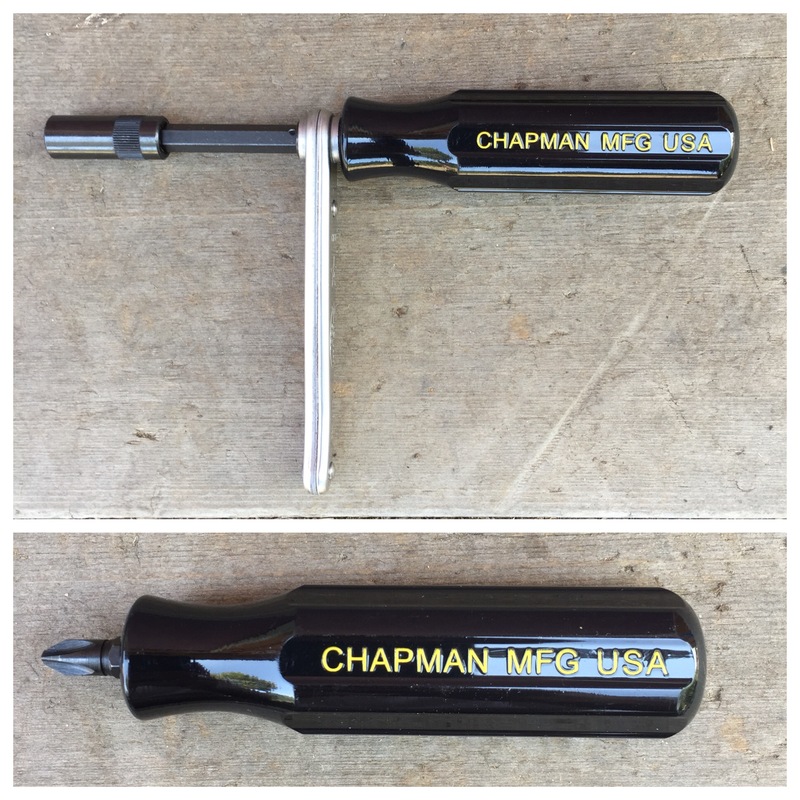 Even if you don’t know it by name, you have probably seen a Chapman MFG Midget Ratchet before… or maybe an imitation. This little ratchet might be the handiest tool in The EDC Tool Roll thanks to its versatility, compact size, and suite of smart accessories. This review will include more than just the Midget Ratchet which is great on its own but really shines for EDC with a few simple additions. 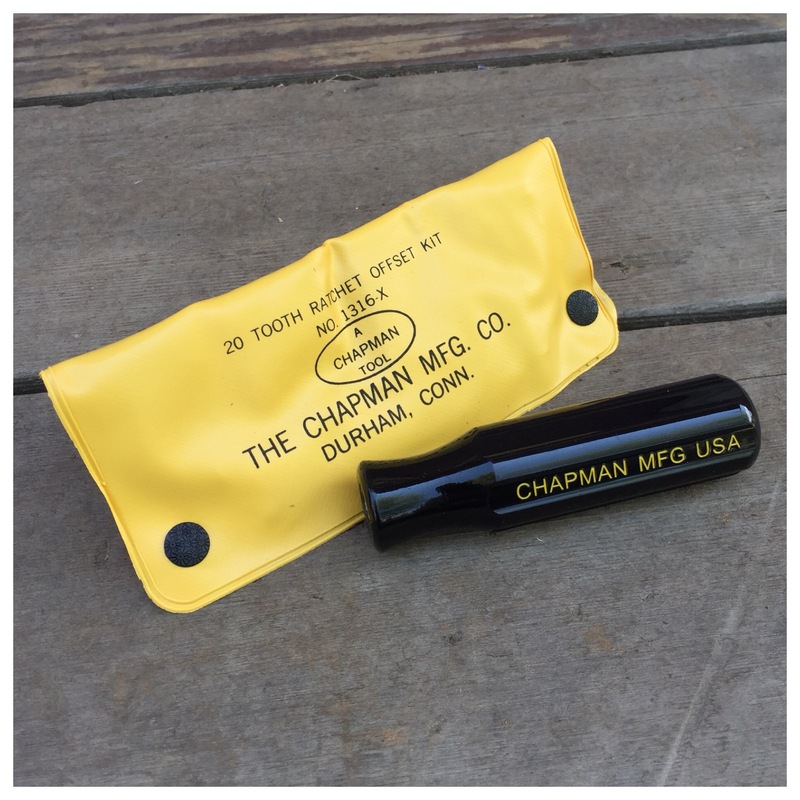 Before I dive into the tools themselves, I want to briefly mention why I like buying tools from Chapman MFG (ChapmanMFG.com). They have been manufacturing since 1936. They make everything here in the USA from materials sourced in the USA. Their tools are in use by the military. The quality and features are excellent and I find them to be very affordable for what you get. They offer an extensive selection of replacement and add-on parts on their website. They even support firearm owners and gunsmiths with tools specifically for that market. This is a likeable company. The Midget Ratchet CM-13 is the heart of this review. It is a compact (3.75″ long) ratchet that accepts 1/4″ shank accessories. The 20 tooth ratchet mechanism is milled from tool steel and heat treated. The mechanism is wrapped in a stamped stainless steel housing that is riveted together. It has a pass-through design that requires no reverse mechanism. You just flip the ratchet over instead of flipping a switch. In short, it is built like a tank and, while its drive mechanism is not very refined, it is positive and works in small spaces thanks to its short length. the Midget Ratchet with the extension to put bits or sockets on fasteners in tight spots. You can even use all three (the ratchet, extension, and handle) fit together at the same time to apply extra torque to fasteners. Chapman MFG states that the Midget can be used to apply about 4 times as much torque as you can with a normal screwdriver. The CMH-3 Screwdriver Handle deserves a brief discussion of its own here. 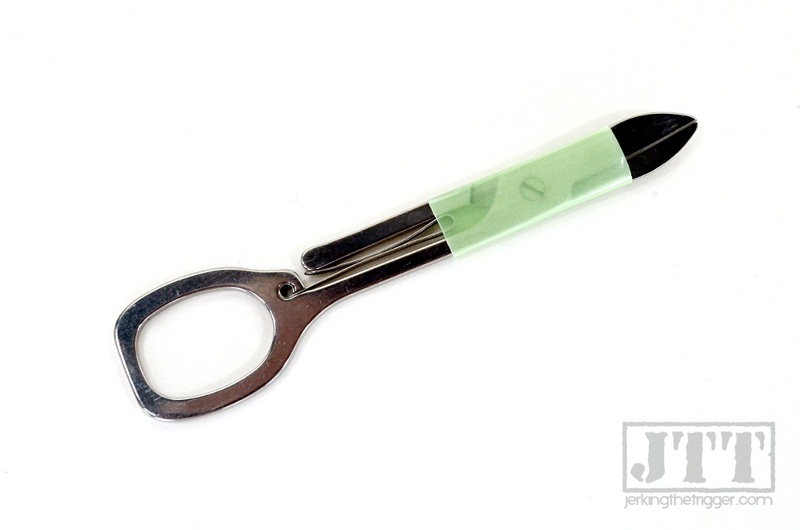 It is made from very hard plastic with a tool steel insert to accept bits or an extension. It’s size is what makes it so great for The EDC Tool Roll. At 3.5″ long and 1″ in diameter, it is as useful as a full some screwdriver but more than compact enough to fit in the tool rolls we have profiled in this series. It is a worthy addition to this kit. Some of you my be disappointed initially to learn that these tools are really made to work with Chapman’s own bits. They will accept and turn standard 1/4″ shank bits but not retain them. Standard 1/4″ shank bits can work in a pinch but it can be a pain to deal with them falling out of the tool. Being able to flip over the Midget Ratchet is integral to its use so Chapman has to build the bit retention into the bits themselves. Each bit has a small detent that prevents it from slipping out of the tool under its own weight. The good news is that the bits are of excellent quality. They are machined well, free of burrs, heat treated, and given a black oxide finish. Each bit (and the extensions) have a small knurled wheel on the back that allows you to turn it with your fingers to help start screws before they have enough friction to ratchet – clever. Together, these parts are amazingly capable. They are compact, versatile, well made, affordable, and just plain cool. Chapman MFG offers a dizzying array of kits most of which includes bits specifically selected for a purpose like a certain trade or maintenance on something specific. They also offer some general use kits that are good but I have had the best luck with putting my own kit together. Make sure whichever kit you choose as a starter includes the 1/4″ socket adapter or purchase it separately. The Midget Ratchet is a great little socket wrench in tight places but you will need the adapter to attach your sockets. I like the 1316 kit as a baseline. It includes a good selection of bits, a Midget Ratchet, and a socket adapter. It is all packaged in a good quality, flexible vinyl organizer that lays mostly flat and easily fits in the compact tool bags we have profiled on The EDC Tool Roll. You can also add the CME-1 3 5/8″ Bit Extension and the CMH-3 Screwdriver Handle. The extension nest nicely into the 1316’s vinyl carrier when it is folded and snapped closed. 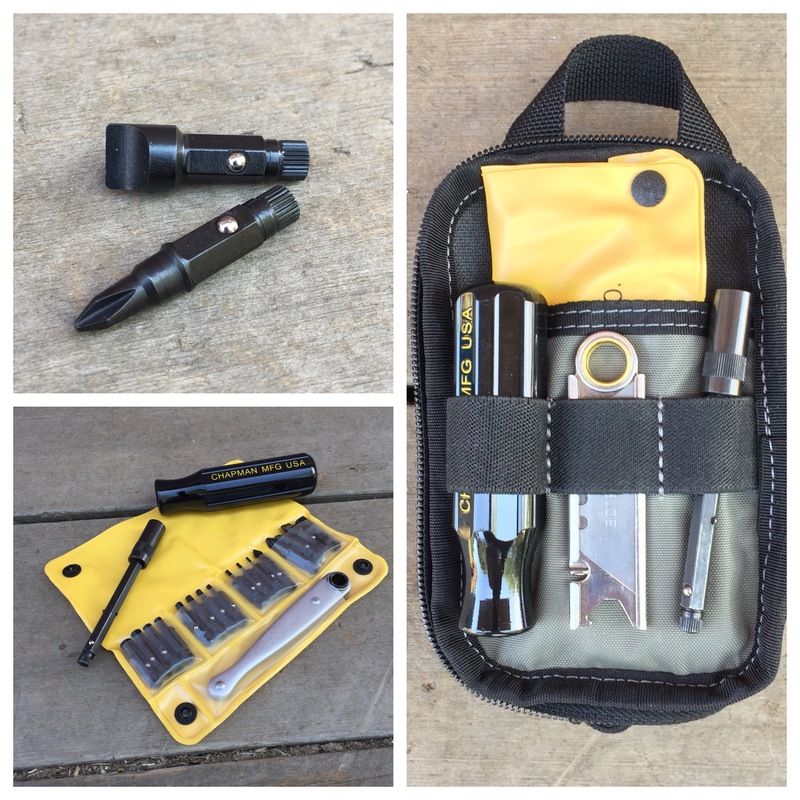 The screwdriver handle can be rubber banded to the vinyl carrier or just tucked into your tool roll. 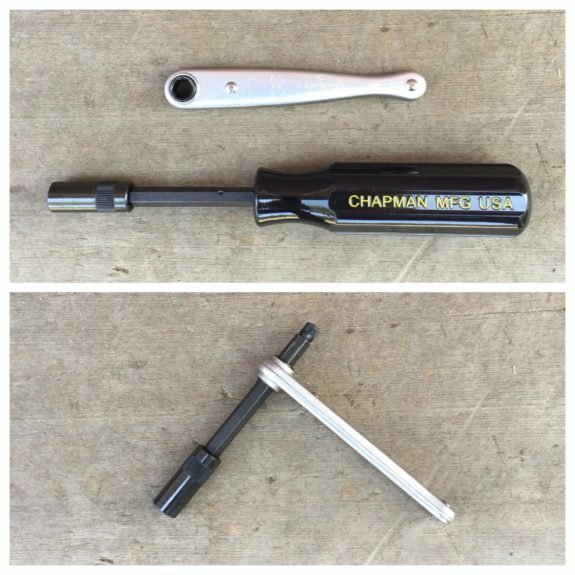 If you just want a minimalist kit based around the Midget Ratchet, the Chapman MFG 2021 kit is affordable and ready to drop into your kit. The Midget Ratchet and its accessories are pretty unique in how they work together but you can piece together other tools to have some of the same functionality. Can you think of another compact tool this versatile or another tool recommendation that fits The EDC Tool Roll? Tell us about it in the comments below or drop us a line on the Contact page. The Victorinox Swisstool Plus Replacement Wrench (VSPRW) is sold as a “replacement” part for the Swisstool Multi-tool but it works just fine as a standalone tool. It is a “L” wrench style driver that accepts standard 1/4″ shank bits at both ends. It is functionally similar to the previously reviewed Engineer DR-07 and Tekton 14-in-1 Offset Driver. However, there are two key differences in the VSPRW’s lack of included bits and lack of overmolded handle. Neither of those differences are really short comings. You likely already have bits and the lack of overmolded handle means the VPSPRW is trimmer and lighter than almost all the other drivers reviewed so far. It still offers good reach and great torque. 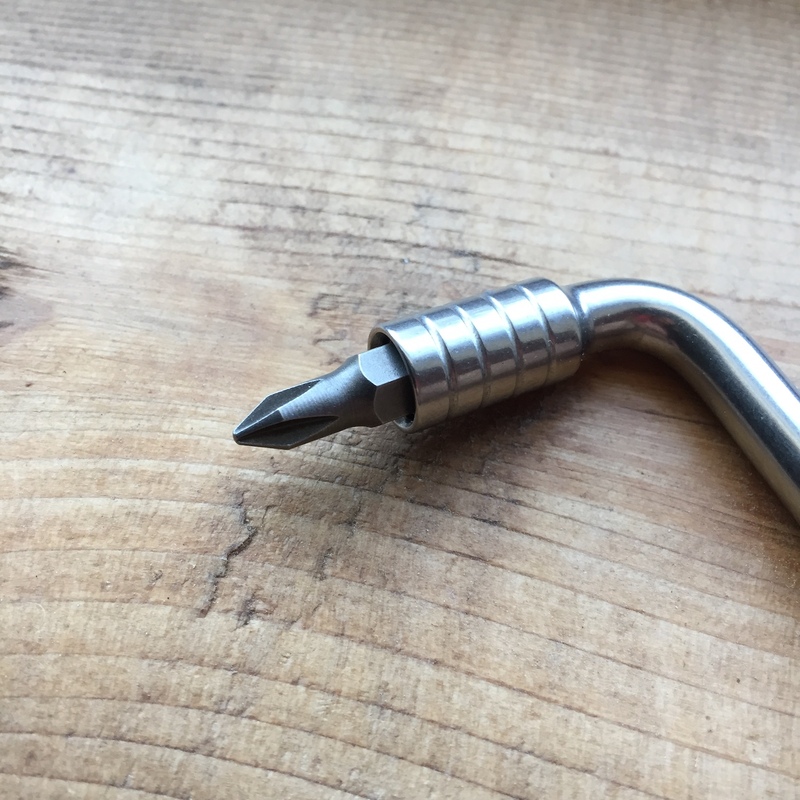 Yes, this tool is simple compared to some but it is also extremely well made (of course, it’s Victorinox) from solid metal, offers captive bit sockets, and costs less than pretty much any other driver we have profiled in the series. It will hold any 1/4″ shape bit including those without the retention notches though bit with the notches will be slightly more secure. Retention is very good with just a bit of wobble. No amount of shaking or jarring will cause the bits to drop out on their own. The bits are easy to change with no active locking mechanism. If space is at a premium in your EDC Tool Roll, I think it will be hard to beat the Victorinox Swisstool Plus Replacement Wrench. Do you have a compact driver that you prefer or another tool recommendation that fits The EDC Tool Roll? Tell us about it in the comments below. 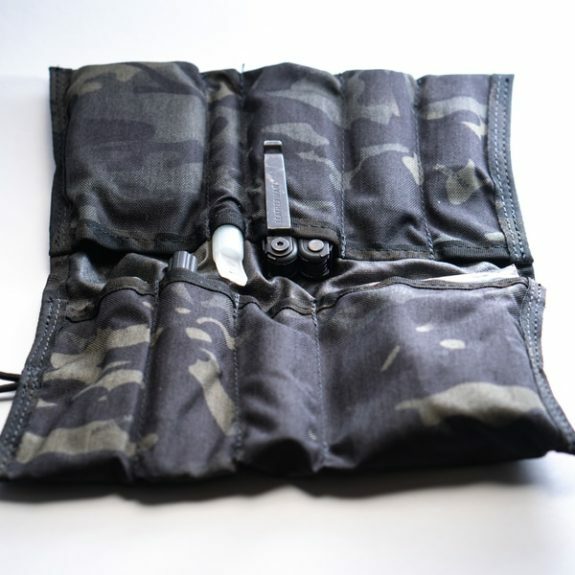 The Wise Men Company’s Pill Bug Tool Roll is an EDC-sized tool roll with tactical sensibilities. It is constructed from 500D nylon and features 9 pockets of various sizes. 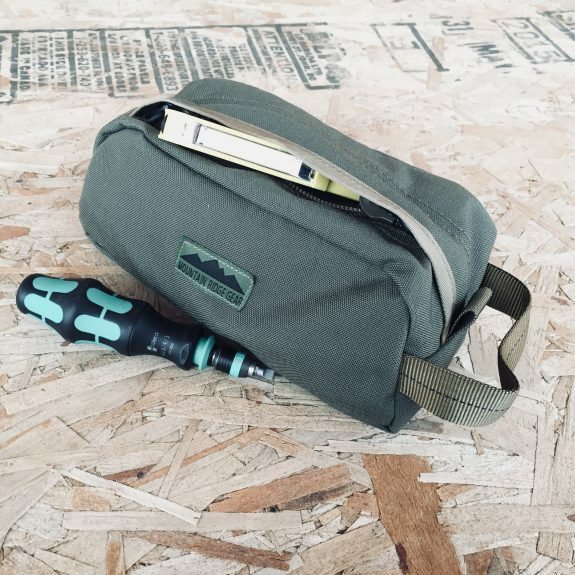 The Pill Bug can be opened and lays flat to present all your tools like any other tool roll. It also folds in half and can then be rolled into a tight bundle which is secured with shock cord. If you have followed The EDC Tool Roll series on JTT, you haven’t seen many true tool rolls because most are larger than is necessary for the types of tools profiled. The Pill Bug however, is sized specifically for EDC so it might be a solid option for those looking to carry tools from that series. I guess the idea of a tool that is essentially a hand held set of compound bolt cutters is attractive to a lot of prepared citizens. Previously, the CoBolt Cutters were only available in 8″ and 10″ lengths but that is about to change. 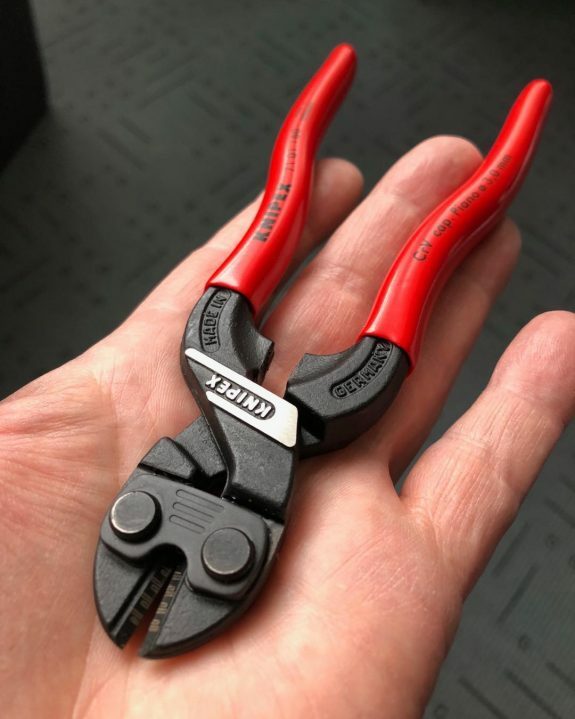 Knipex has announced that they will release a 6 1/4″ Mini CoBolt. The Mini CoBolt Cutters will likely give up some leverage to the larger 8″ and 10″ models. It will take some testing to see if these can serve as a more compact option that are still suitable for bug out bag tasks. If you follow our regular feature, The EDC Tool Roll, you’ve seen the Fix It Stick Replaceable Version before. It is one of my all time favorite EDC-worthy tools and a mainstay in my range bag. I didn’t think I needed another one until I saw the new version that comes with a slick holder. The original Fix It Sticks Replaceable comes in a very nice nylon pouch but this new version comes with a newly designed bracket that holds the tool and up to 18 bits (14 on the bracket, 4 on the tool sections) in a compact package. It would be perfect for dropping in your EDC or range bag. Fix It Sticks are already a great, American made tool. This new bracket makes them even more attractive. The quest for the perfect pocket tool kit continues! 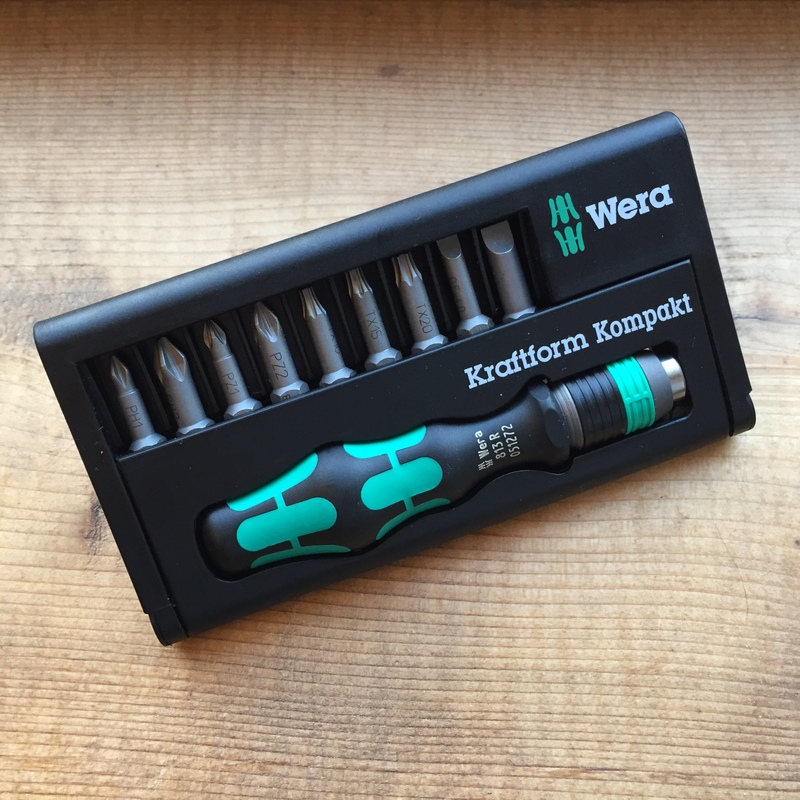 The vast majority of tool recommendations that I have received have been for drivers and a handful of readers recommended the Wera Kraftform Kompakt (KK) 10 especially after I reviewed the Kraftform Kompakt 25. 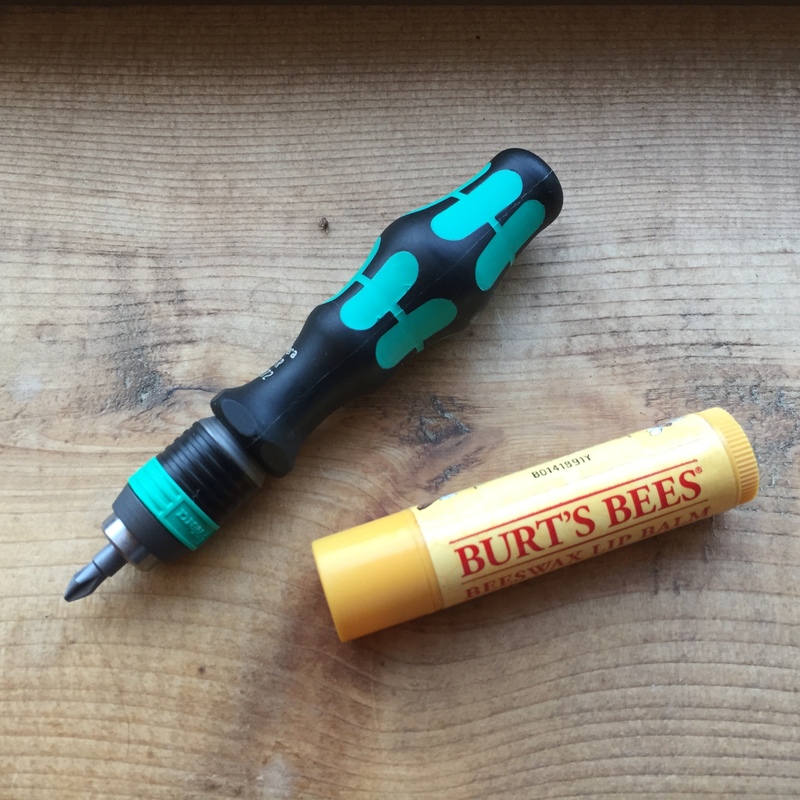 The KK 25 is basically a full size screwdriver that collapses down to a more pocketable size. The KK 10, the subject of this installment of The EDC Tool Roll, is a true pocket screw driver. It starts small and stays small. The Wera KK10 is barely larger than a tube of chapstick so it fits in even the smallest tool kits. However, unlike many small drivers, you can actually get some work done with it. The handle is wide enough that you can apply decent torque and it is comfortable to hold thanks to Wera’s ergonomic design. 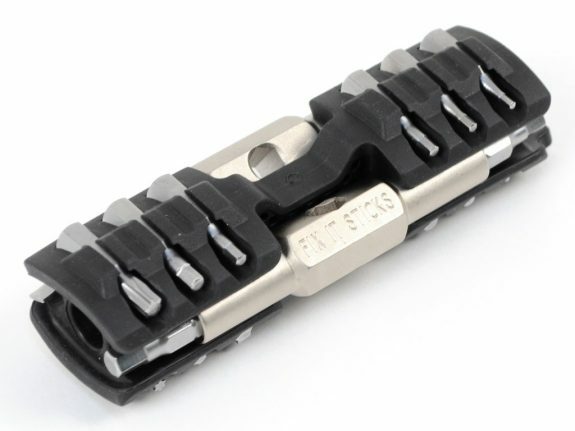 The KK 10 uses the same Wera designed Rapidaptor bit holder found on the KK25. It is the best I have used. It holds the bit positively, releases them easily by lifting the collar, and the collar rotates freely so you can sort of pinch it there to hold the bit in the fastener as you turn. Wera’s bits are of excellent quality. The KK 10 will accept any standard 1/4″ shank bits so you can customize your kit based on the fasteners you encounter (especially handy for your range bag). Wera provides an assortment of 9 bits with the tool: 2 TZ Slotted bits – 1/8”, 7/32”; 2 TZ Phillips bits – PH1, PH2; 2 TZ Pozidriv bits – PZ1, PZ2; 3 TZ TORX bits – TX10, TX15, TX20. The included T15 Torx bit is especially nice since that size is common for scope mounts. The KK 10 comes with a slick plastic holder that I promptly put away in a box somewhere. It is just larger than I really need in my kit. I can easily store the handle and bits (in a small bit holder) separately so they take up less space. However, the case really is quite nice and may be useful to some. I should also note that Amazon prices change all the time. It is actually a little cheaper now than when I bought mine. 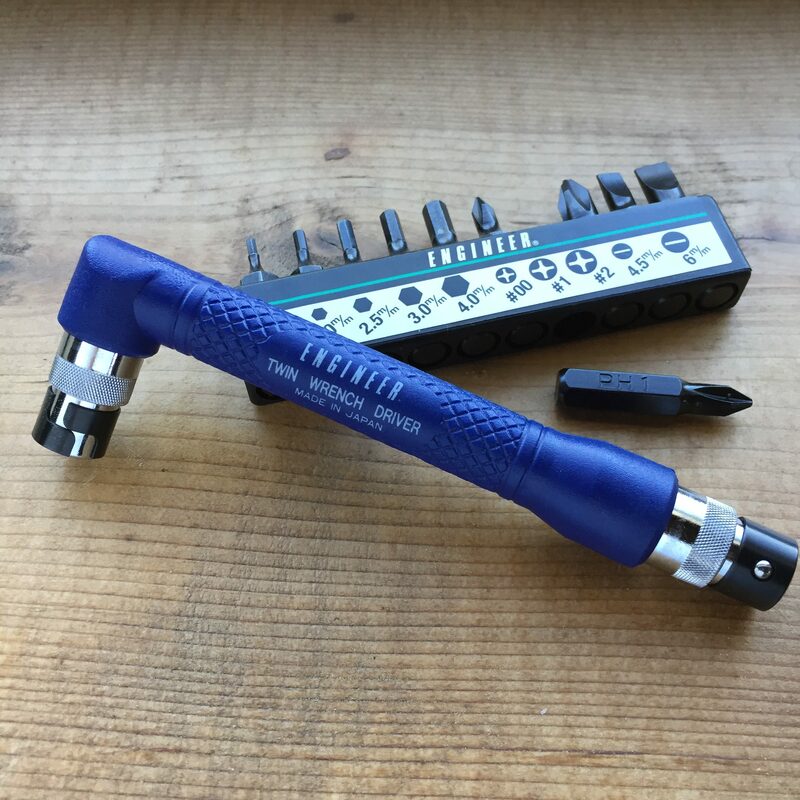 Alternatives: As much as I like the KK 10, I think I still prefer the Engineer DR-07 Twin Wrench Driver and it’s price seems to be dropping like a rock on Amazon. It’s “L” wrench shape makes it easier to apply torque but the bit holder on the Wera Tools is almost too hard to resist. Both options are very well made and work great in a compact tool kit. I started writing this series because I built my own pocket tool kit to make my life easier around our property. My wife suggested that I write about the kit and I am glad she did because it has grown into one of the most popular features on JTT. So much so, that I have received a ton of great suggestions from readers including a few that have asked for suggestions for a tool bag that is still compact but that can carry more tools than the pocket sized options that we have already covered. Coming up with a recommendation was easy because I already have the perfect bag. Mountain Ridge Gear (MRG) makes 4 different sized Duffel Bags that range from very large to very small. The smallest, a size MRG calls XS, is a perfect size for a compact tool kit at 9″ x 4″ x 4″. I know it can be hard to visualize dimension so think of a typical toiletry bag and you’ll understand the size of the MRG XS Duffel. I can fit every tool that we have profiled so far in The EDC Tool Roll series inside of it. The XS size is perfect for stuffing inside of a larger bag like an EDC backpack or range bag. It has a tubular webbing handle built into one end that makes it easy to retrieve from inside of another bag. These bags are BOMB-PROOF and super affordable. MRG sews them right here in the USA, Colorado to be specific. 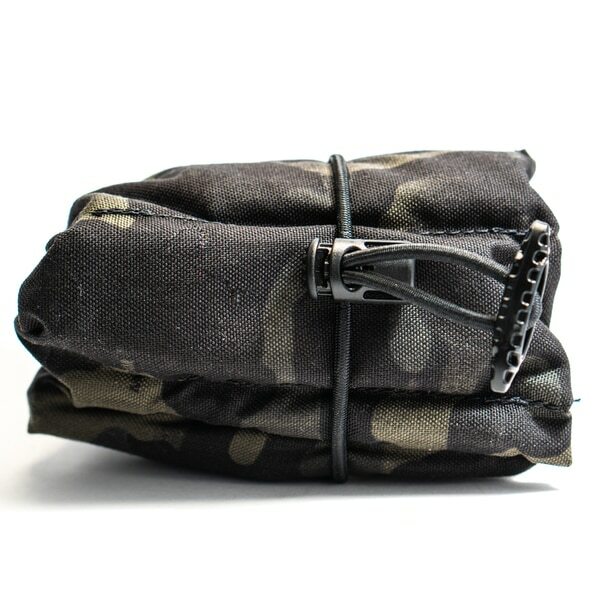 They use 1000D Cordura Nylon and beefy #10 YKK zippers. Every single edge is bound with tape so every seam is reinforced and there are no bare edges to start fraying. MRG makes these bags to last in a way that few nylon companies still do and the bag still only costs $15 shipped! I am not sure you can get a cheap, off-shore produced tool bag for less than that. These bags are a bargain. When I purchased this one, I should have bought a whole stack of them because there is no shortage of ways to use a bag like this. They are a great size for travel, vehicle first aid kits, tool bags, chainsaw tools, and all kinds of other uses. Where to Buy: The XS Duffel is only available from Mountain Ridge Gear. It’s $18 including shipping! Alternatives: I am sure there are other small bags out there that would work but it will be tough to beat the price and quality of the MRG XS Duffel. We have covered two smaller “tool bags” in this series already. Do you have a compact tool bag, tool roll, or other tool that want to recommend? Tell us about it below. The EDC Tool Roll series has generated more reader email than just about anything that has ever been on the pages of JTT. You’ve really come through for me with recommendations. Several emails have asked when I was going to include a flashlight in this series and I typically responded that I was hesitant to do so because I think most of us are already carrying a flashlight. Reader James R. changed my mind when he showed me the Nebo Tools series of pocketable work lights. I wish I would have known about these years ago. To call these lights “flashlights” does them a disservice. They really have more in common with your typical work light that you would find on a small stand or tripod… except these fit in you pocket or small tool kit. Like a work light, they are designed to be used hands free. You can obviously hold them in your hand but they really work best out of your hands. They have a rotating pocket clip that allows you to clip the light to your clothing (shirt pocket, collar, etc.) for hands free use and then aim it where you need it. 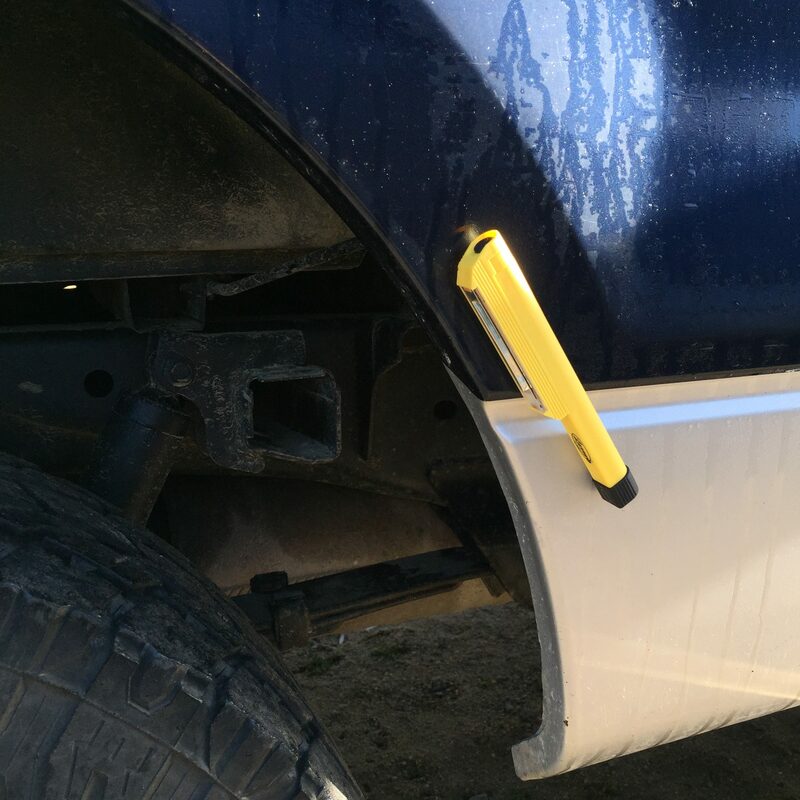 The clip is also magnetic so it can cling to ferrous surfaces like your vehicle, your tool chest, or even the 74″ PTO snow blower that are getting ready for winter (ask me how I know). They can be stood on end on a level surface. Here is a trick I figured out that is probably the most versatile way these can be used. I’ve found that I can stick them to a steel tool as ballast so that I can place it on any surface without worrying about it tipping over. I can direct it anywhere I need it in this configuration. It works really well when stuck to a handgun magazine on the range if you need to light up an admin area during low light training and it takes up about the same amount of room as a marker in your range bag. A long, wide LED emits 170 lumens of light. This ribbon like emitter is used, rather than a smaller point of light in the center of an optic or reflector, to create a wall of light with no discernible hotspot. 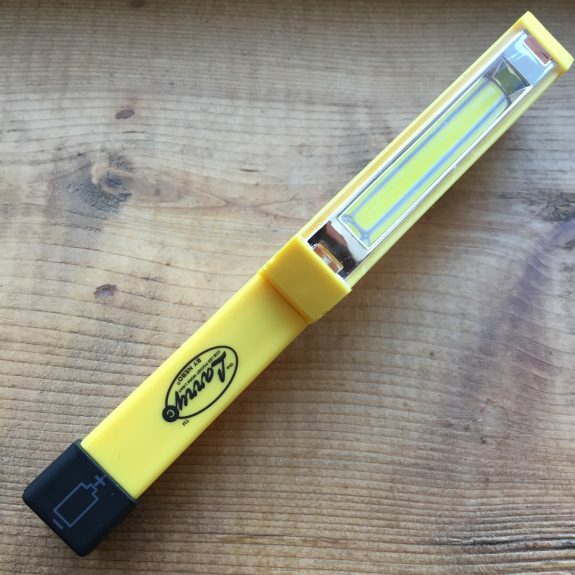 It lights up a room evenly from a distance or can be used to light up your work piece up close without washing out thanks to the lack of hotspot. I get about 3(ish) hours of continuous runtime before I swap batteries. There are a number of similar lights on the market and, honestly, it can be hard to tell which ones are decent so I was happy to have a direct recommendation of the Nebo Tools line. They are dirt cheap ($7-8 a piece for the model shown) and seem to be of decent quality. They also have a solid review history. The lights shown in this review are the Larry C model. They take 3 AAA batteries and are fairly compact but they are long(ish) since the batteries are installed end to end. They just barely fit in my tool kit. There are a number of other lights in this format with different battery configurations offered by Nebo Tools including more compact models that take two batteries. Where to Buy: I’ve seen similar lights at some brick and mortar hardware stores. I purchased mine at Amazon because that was the easiest place I could find the Nebo Tools brand that was recommended to me. I purchased a 3 pack for just over $7 a piece ($21.01 total) including batteries! These lights are available in a variety of colors, battery configurations, and bulk packs (this is an affiliate link). Alternatives: Similar lights are available from a number of brands – just make sure you don’t overpay and that they will work hands-free all the ways you need them to. You could also use the EDC light you are already carrying. Do you have a compact work light or other tool that want to recommend? Tell us about it below. The Engineer DR-07 Twin Wrench Driver is my favorite screw driver solution for a compact tool kit. I’ve had it for some time now and purposely held off on mentioning it here until I could test the Tekton 14-in-1 Offset Driver as a potential lower cost alternative. While the Tekton is functional, everything about the Engineer DR-07 is a step above. The Engineer DR-07 Twin Wrench Driver is a Japanese manufactured replaceable bit screw driver that accepts bits at either end of its “L” shaped handle. The 10 included bits and bit carrier are of excellent quality and well marked both on the bit carrier and the bits themselves. The included bits are very much like standard 1/4″ shank bits but slightly longer. However, the DR-07 will accept standard bits though they sit slightly deeper in the bit holders. The bits are retained via a detent and spring steel collar. This set up applies solid tension even on bits that aren’t notched. The spring steel collar is thicker and provides better tension than the one found on the Tekton version. The bit holders are also magnetized which is a nice touch. The Tekton version of this tool has a hard plastic cover on the handle but the Engineer DR-07 features a very resilient rubber handle that feels great in the hand. The rubber is molded over an entirely steel structure beneath for strength. 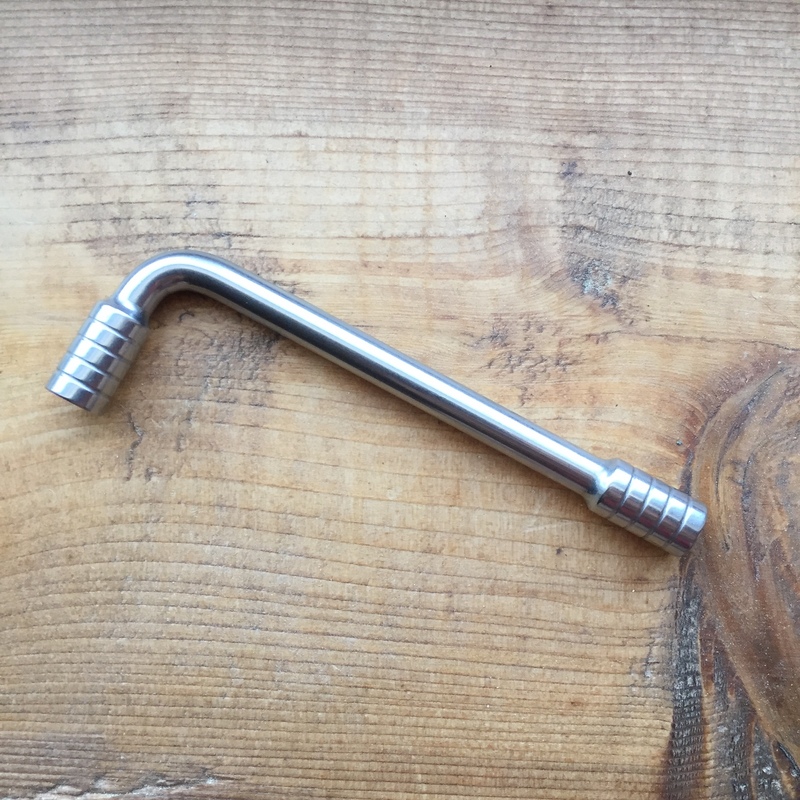 The DR-07 also has finer knurling on the bit holders that allows good grip and fine control when turning a screw. The beauty of this driver is the offset design. This “L” shape keeps the tool very compact but allows the user good reach and the ability to apply a lot of torque when necessary. This one is what you will find in my EDC Tool Roll more often than not. It is one of the few compact drivers that can actually reach screws like an AR-15 grip screw and still provide enough tool to hold onto when loosening or tightening the screw. I should note that, like the previously profiled Tekton driver, this tool does NOT ratchet. For some reason, almost everyone who puts hands on this thing thinks it is going to ratchet but it does not. Everything about this tool screams quality. The chromed finish is smooth and seemingly very durable. The bit holders have great tension and use robust parts to retain the bits. The grip is very comfortable in the hand. The included bits and bit holder are some of the nicest I’ve seen included with a tool like this. I own a handful of tools from Engineer and this is what I have come to expect from them. You may also be able to find a deal on auction sites. Be advised, these will ship from Japan most of the time so expect to wait. Do you have a compact driver that you prefer or any other tool you want to recommend? Tell us about it below.